Dubai's Roads and Transport Authority (RTA) has announced the opening of three new bridges as part of the Airport Street Improvement Project on Friday. By opening these bridges, the RTA completes the opening of all bridges on the Airport Street; which considerably contributes to easing the traffic flow. A two-lane tunnel will be opened to serve the traffic inbound from the Airport Street heading towards Marrakech Street in July this year, said a statement from RTA. 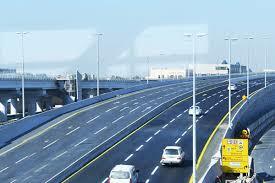 Bridges to be opened include a two-lane bridge to serve the traffic from Nad Al Hamar Street to the Airport Street. This bridge will ease the snarls resulting from the overlapping traffic at Nad Al Hamar Interchange between the first circular slope heading leftward from Nad Al Hamar to the Airport Street, and the second circular slope heading leftward from the Airport Street to Nad Al Hamar Street. The traffic on the first circular slope will be limited to U-turns in the direction of Nad Al Hamar Street, it stated. Upgrading Marrakech-Aiport Streets Junction includes the opening of a ramp leading to Terminal 3 of Dubai International Airport; which enables motorists access to the building without waiting at the junction. RTA will also open the bridge leading to the premises of the Dubai Aviation Engineering Projects (Ex location of the Dubai Airshow), said the RTA in its statement. The opening of all bridges at the four junctions of the Airport Street increases the intake of the Airport Street by as much as 5,000 vehicles per hour. It will also step up the traffic safety and flow,, it added. The project is needed to cope with the sharp growth rate in the number of passengers using Dubai International Airport; which is expected to hit 92 million passengers by 2020. The Airport Improvement Project comprises upgrading four junctions. The first was Rashidiya junction; which included the construction of two bridges on the Airport Street of three lanes in each direction. The second included upgrading the Airport-Nad Al Hamar Streets Junction through constructing a two-lane ramp to serve the traffic from Nad Al Hamar Street to the Airport Street. The third junction included upgrading Marrakech junction through the construction of two bridges of three lanes in each direction along with a ramp leading to Terminal 3 of Dubai International Airport without waiting at the light signal, said the RTA statement. It also included the construction of another bridge leading to the premises of the Dubai Aviation Engineering Projects (Ex Dubai Airshow) and a two-lane underpass to serve the traffic heading leftward from the Airport Street in the direction of Marrakech Street. The fourth junction covered upgrading Casablanca Street junction through the construction of an additional single-lane ramp to serve the traffic from the Airport Street in the direction of Casablanca Street, thus eliminating the waiting time at the light signal, it stated. RTA said the scope of work included the construction of an alternative route for traffic inbound from Al Garhoud enabling direct access to Terminal 1 and 3 of the Dubai International Airport, besides increasing the number of lanes of Casablanca Street in the direction of Al Garhoud from 3 to 4 lanes.